Country Inn & Suites by Carlson is no new name in the hospitality industry-sprawling across nine acres covering the wonderful landscapes of the Himalayas, providing a very salubrious environment to stay as well as offering breath taking vistas of the valley. There is an outdoor swimming pool where you can unwind yourself while enjoying an on-site spa. 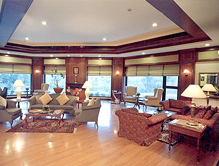 The hotel is decked with all possible modern day amenities that promise an elegant stay during your visit to Katra. Being situated on the Jammu – Katra Highway, you can easily visit nearby attractions like Patnitop and Shiv Khori in no time. Enjoy the high speed Internet throughout the hotel. Availability of Business Center caters to your fax, Xerox and other computer services. 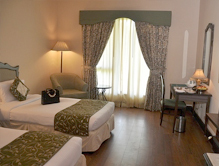 Accommodation The hotel has 77 rooms offering all the latest amenities and luxurious interiors. There are options of Deluxe Rooms, Executive Suites and Presidential Suite with each room having their own added benefits. Every room is equipped with complimentary news paper, lavish bedding, large windows, coffee maker, high-speed wireless internet service and cable TV. Both the Executive and Presidential suites have mini bar, separate living room, view of garden and dining tables, but the Presidential has an additional kitchen, a microwave and private balcony. 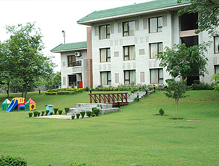 With all the above facility, it is sure that you will have the time of your life during your vacations in Katra. Dining There are three dining facilities for the guests, The Maple, a multi cuisine vegetarian restaurant featuring some of the finest Asian, Indian and Mexican cuisines; Trikuta Tea Lounge, a perfect place for the morning tea or coffee. Apart from amazing brews one also can view the Vaishnodevi Shrine form the lounge; Amphitheater, surrounded by lush green landscapes of the Trikuta Mountain it is the ideal place to have a romantic meal with your loved ones.